Supporting teachers to develop their own creative writing practice, giving educational leaders the confidence to inspire and bring creative skills back into the classroom. Our popular Creative Writing for Teachers CPD programme is suitable for primary and secondary school teachers, as well as those who teach Post 16 and adult classes. Meeting five times over the academic year at Gateshead Central Library, the group takes part in writing workshops led by professional and experienced writers. The course costs £99 per person and begins on Thursday 31 January 2019. Reserve your place by 21 December 2018. The Creative Writing for Teachers programme brings together like-minded peers from across the teaching profession, allowing participants to take the time to develop their own creative writing practice, share ideas, and reflect on their creative writing teaching. We provide a relaxed and informal environment for teachers to explore their individual creativity, building confidence and inspiring imagination for you to take back to the classroom. The programme has been running annually since 2012, when we collaborated with Northumbria University to support a PhD by Dr. Caroline Murphy called Practice, Pedagogy and Policy: the influence of teachers’ creative writing practice on pedagogy in schools. This piece of research evidenced what we have demonstrated throughout over 20 years of work in schools: that teachers who practice their own creative writing are more confident when teaching it. 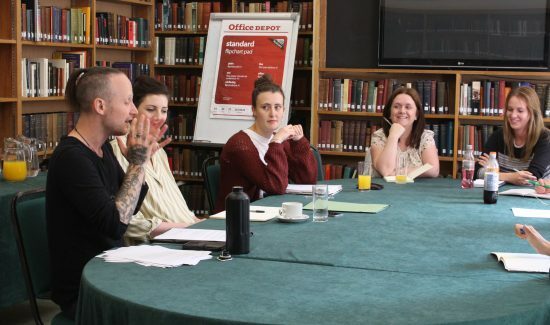 If you are a teacher looking to support a creative young person outside of school, please see New Writing North Young Writers, our programme of activity for young people. We run free weekly creative writing and songwriting workshops in towns and cities across the North East, as well as journalism projects and creative writing Summer Schools for young people. Teachers can also nominate young people for our annual Northern Writers’ Awards. We work extensively with young people in schools, during the school day and in extra-curricular sessions through our Young Writers’ City project and schools programme. We can also work with schools to design a bespoke programme of writer-led creative writing activity for teachers or pupils. This could take place over a day, or comprise a series of workshops, according to your needs. It can be used to support an application for Artsmark status for your school, or to address specific issues that you want to focus on from your School Development Plan. To take part in Creative Writing for Teachers, to book CPD sessions in your school or to create your own bespoke project, contact Holly Sinkinson, Programme Officer at New Writing North at holly@newwritingnorth.com or call 0191 204 8841.